Italian food has to be right up there when it comes to comfort food – I mean what could be more cosy and warming on a chilly winters day than a big old bowl of pasta with a rich, creamy sauce? You might think that by not eating gluten or dairy that such meals are wholly in my past life, but do not fear, as I have only gone and resurrected the carbonara and given it a delicious healthy makeover. And a much needed one in my opinion, as although I did used to like a plate of spaghetti de temps en temps, carbonara was always just that little bit TOO rich and creamy for my taste buds (and my tummy). This version has everything tastewise that the original has to offer, but it’s just so much lighter and there’s not an ounce of stodge to be found. You only need eight ingredients, and you can whip it up in next to no time. It’s just soooo creamy thanks to the combination of blended cashews, avocado and almond milk and adding nutritional yeast and salt gives it a wonderfully cheesy flavour too. If you’re not a veggie, this is great with some chicken, Parma ham or prawns thrown in – I usually add some of these in for Mr H to up the protein content – but you could use tofu or beans instead if you like. Chop the mushrooms into slices and sautée them in the olive oil on a medium heat for about 10 minutes, stirring occasionally. While these are cooking away, pop the cashews, avocado, almond milk, garlic and nutritional yeast in a food processor and whizz for around five minutes or until it becomes totally smooth and creamy. Add in any salt and pepper to taste and continue blending for another 30 seconds to mix it all in. 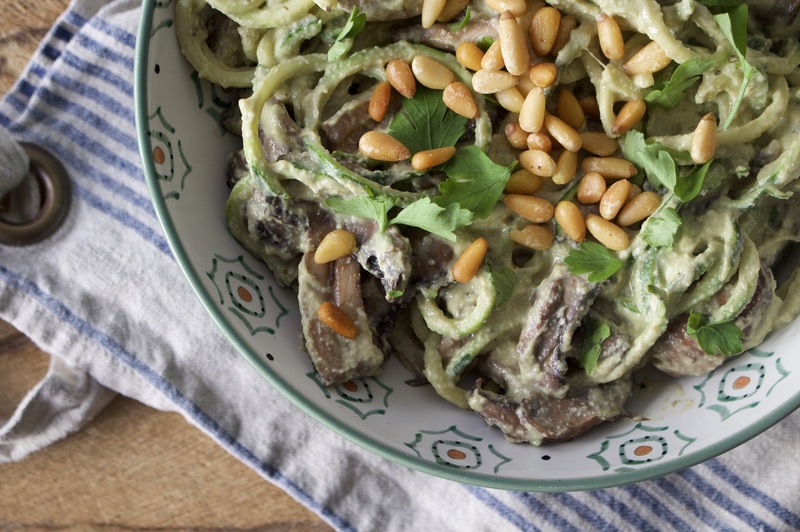 In a mixing bowl, place the spiralised courgettes and sautéed mushrooms and then spoon in the sauce. 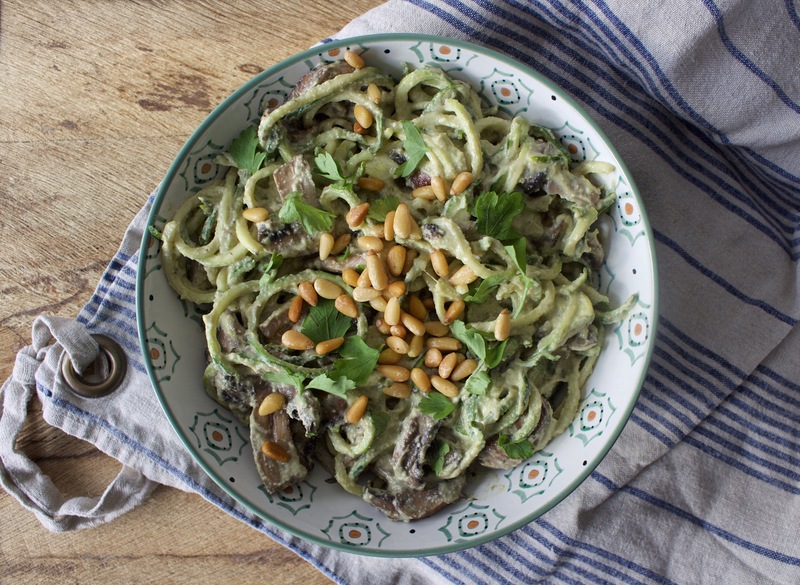 Mix it all together using a couple of forks to make sure the sauce is distributed evenly and then top with pine nuts and coriander and serve.